SAN JOSE, Calif. — May 1, 2018 — JetStream Software Inc., an innovator in cloud software development, today announced that JetStream Migrate is available to customers of VMware Cloud on AWS. JetStream Migrate facilitates the seamless live migration of enterprise virtual machines (VMs) and their workloads from on-premises data centers to the cloud. To learn more about the challenges and opportunities around live migration, please see “Live Migration and Why It Is Important to VMware Cloud Partners” by JetStream Software CTO Serge Shats: http://ow.ly/lcxb30jBrEn. 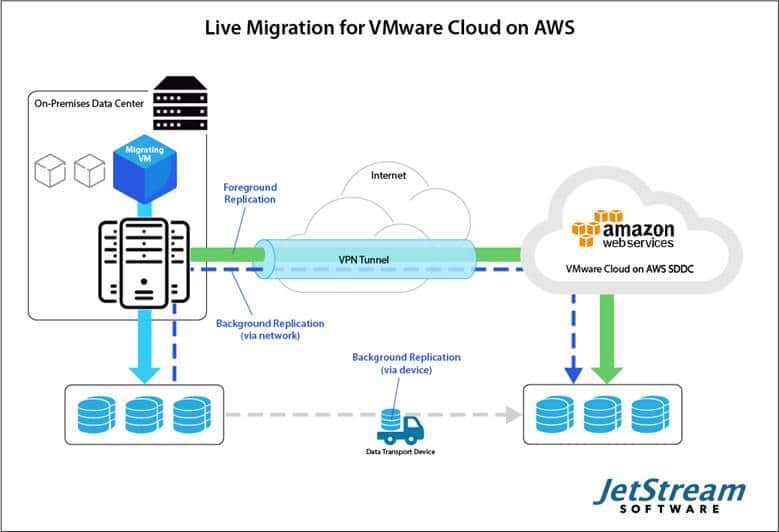 JetStream Migrate, a key component of the JetStream Cross-Cloud Platform, enables customers of VMware Cloud on AWS to migrate data from their on-premises data center to AWS, while ensuring continuous operation of the applications on the VMs during data replication. The application is designed to support live migration in a variety of circumstances, including data replication via physical data transport device and data replication over non-optimal network connections. Delivered, sold and supported by VMware as an on-demand service, and running on elastic, bare-metal AWS infrastructure, VMware Cloud on AWS is powered by VMware Cloud Foundation, the unified software-defined data center (SDDC) platform that integrates vSphere, VMware vSAN and VMware NSX virtualization technologies. With the same architecture and operational experience on-premises and in the cloud, IT teams can quickly derive business value from use of the AWS and VMware hybrid cloud experience. For more information on the VMware Cloud on AWS partner ecosystem, visit http://cloud.vmware.com/vmc-aws. JetStream Software Inc., an innovator in cloud software development, delivers the JetStream Cross-Cloud Platform for next-generation cloud data management. The company gives cloud service providers (CSPs) and Fortune 500 enterprise clouds a better way to support workload migration, resource elasticity, and business continuity across multi-cloud and multi-data center infrastructures. JetStream Software is optimally suited to complement VMware cloud infrastructures including VMware Service Provider Partners (VSPPs) and VMware Cloud on AWS. JetStream Software is headquartered in San Jose, California with a wholly owned subsidiary in Bangalore, India. The company is privately held. For more information, please visit www.jetstreamsoft.com, www.linkedin.com/company/jetstream-software-inc/ and @JetStreamSoft. JetStream Cross-Cloud Platform, JetStream Migrate and JetStream Accelerate are trademarks of JetStream Software Inc. All other brand names and product names are trademarks or registered trademarks of their respective companies. VMware, VMware Cloud, vSphere, Cloud Foundation, vSAN and NSX are registered trademarks or trademarks of VMware, Inc. in the United States and other jurisdictions. Editor’s Note: Additional graphic images are available from [email protected].